When it comes to having a storied history, coral has serious bragging rights. The ancient warriors of Gaul in Western Europe used it as a protective ornament on their weapons of war, while Romans in the Middle Ages relied on it as a talisman against witchcraft and danger. In Greek folklore, it was also believed that Poseidon, the god of the sea, resided in an opulent palace decked in the precious stone. The gemstone even has a fascinating (and gory) origin story: According to Greek mythology, it was created from the blood of the monster Medusa, who was killed by Persus. He had placed her decapitated head on a rock while washing his hands and later discovered her blood had flowed into the sea and turned the seaweed into red stone. Most commonly found in hues of red and pink, coral has also been favoured by royals for centuries. During the Nara period in Japan (710-794 AD), Emperor Shomu and Empress Komyo wore crowns bedecked with tassels of coral beads. In parts of present-day West Africa, the stone remains a symbol of royalty and is donned by kings and nobles, while in Nigeria, coral beads feature prominently as part of bridal ceremonial outfits. More recently, the stone has featured in much-desired high jewellery and luxury timepieces. In June 2015, Van Cleef & Arpels rolled out its Seven Seas collection comprising pieces festooned with vivid gems such as coral, chrysoprase and pearls. 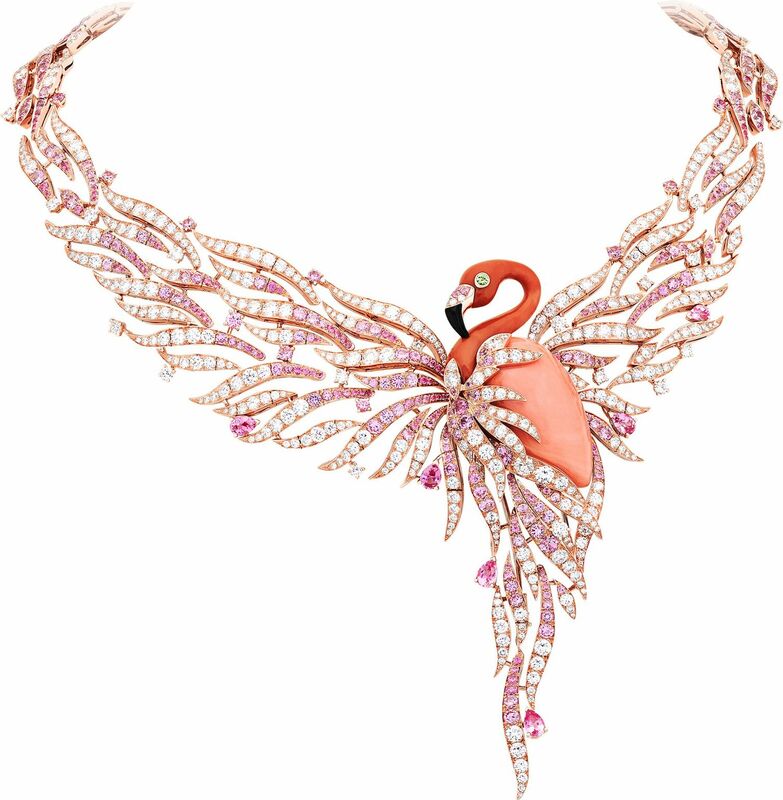 One of the standout jewels was its Flamant Corail necklace shaped like a flamingo spreading its wings. The bird’s head and body was crafted in red and pink coral, which complemented the surrounding assortment of pink sapphires and diamonds. There was also a matching pair of earrings set with pink coral. Over at Cartier, its latest Étourdissant collection is the first time since the 1920s that coral is used so extensively. The jeweller introduced an eye-popping platinum necklace with coral beads interspersed with emeralds and pearls, as well as a ring and bracelet adorned with coral, emeralds, onyx and brilliant-cut diamonds. Bulgari also presented a stunning pink gold necklace embellished with coral, as part of its Italian Gardens collection that was launched at the same time. In the realm of timepieces, Chanel’s Mademoiselle Privé Coromandel Glyptique range from 2015 features coral elements on the dials, which are decorated with bird motifs. While other gemstones originate from minerals, coral is organic and naturally formed in the ocean. It comprises clusters of sea creatures called coral polyps, which have limestone exoskeletons. The parts used in jewellery are obtained from the hard, branch-like skeletons of the polyps when they die. After being harvested, the coral is usually polished to attain a glossy effect. Coral typically comes in various shades of pink and red. It is also available in other colours such as white, blue, gold and black. These, however, are rare. The most common coral used in jewellery is the red-hued Corallium rubrum, which has a relative density of 3.86 and hardness of 3.5 on the Mohs scale. In recent years, coral harvesting has become a controversial topic due to the reefs becoming an endangered species. Last year, the US National Oceanic and Atmospheric Administration added 20 coral types to its list of Endangered Species Act — a tenfold increase from 2013. 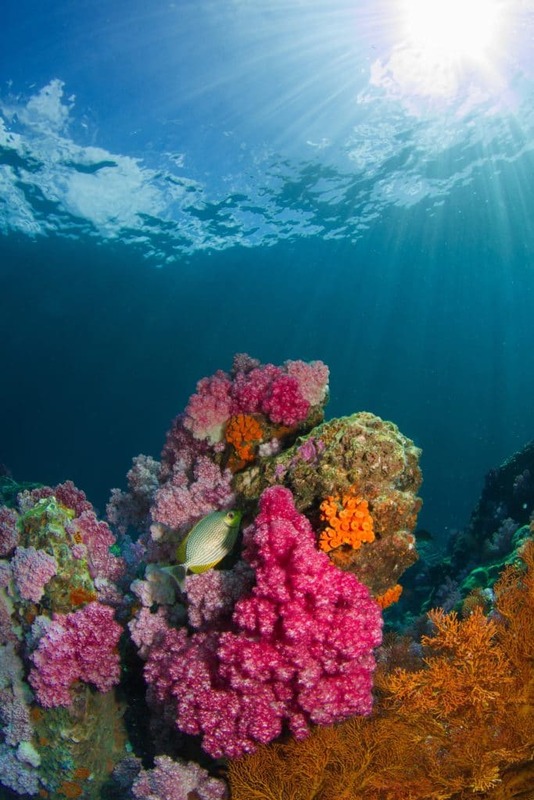 As a more environmentally friendly alternative, some jewellers such as Chanel and Cartier have turned to using existing corals in the market. In cases like these, the precious stones are taken from old jewels, cleaned up and polished before being reused in new designs. Red and pink coral is usually harvested from the Mediterranean Sea, while blue coral can be acquired from Cameroon. As for the rare black and gold corals, they can be obtained from the waters of Hawaii. Other places where coral can be found include Japan, Taiwan, the Cape Verde islands and the Atlantic coast. One of the most well-known producers of coral jewellery is Torre del Greco in Naples. The city created red coral pieces since the 17th century, sourcing its stones from the Mediterranean Sea. There is even a dedicated coral museum there named Museo del Corallo Camo. Corals are weighed in carats. Top-grade corals are consistently coloured without any cracks, holes or defects. They must also be round or oval-shaped with a smooth surface. There is a wide variety of coral types, but among the most sought-after are the deep red Sardinian coral (which is known for its hardness) and Japanese “oxblood” coral, which is dressed in a crimson hue and harvested from the Western Pacific and off the coast of Tosa in Kochi, Japan. Also highly valued is pink coral, ranging from shades of red to peach, and fished from the waters surrounding Japan. A particularly rare species is angel skin coral (known as boke in Japanese), which comes in white with a dusting of pink. In March 2015 at a Sotheby’s London auction, a long coral Alhambra necklace from Van Cleef & Arpels went under the hammer for £22,500. 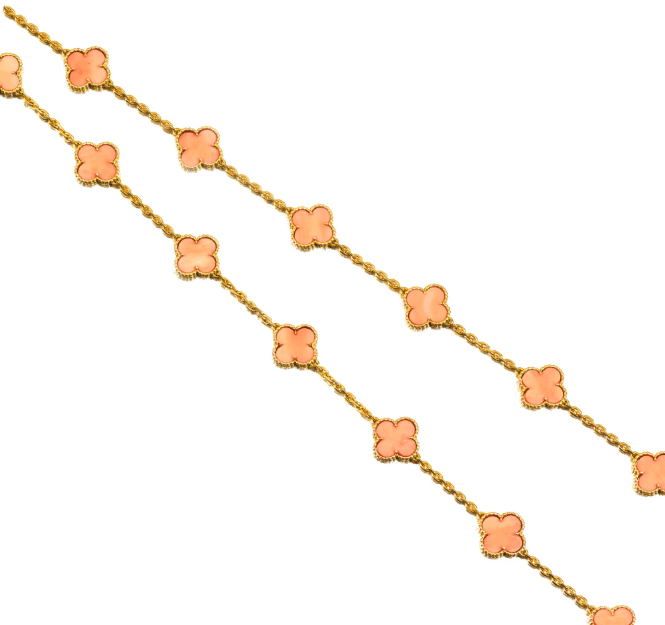 The piece comprised delicate clover motifs mounted with pink coral and connected by an 18k gold fine link chain. The design dates back to the 1970s and was even favoured by royalty: In 1975, HSH Princess Grace of Monaco was so enamoured with it that she purchased it along with variations in malachite and tortoiseshell.